Even the Internal Revenue Service thinks it's better to give than to receive—at least the IRS gives you a tax break for giving. Donations to qualified charities are considered tax deductible expenses so they can reduce your taxable income, lowering your tax bill. Not everyone can deduct their charitable contributions, however. You must itemize your tax deductions to claim any charitable donation, and this is typically only in your best interest if the total of all your itemized deductions exceeds the amount of the standard deduction you would receive for your filing status. You claim a tax deduction for charitable giving on Schedule A of Form 1040. The schedule isn't just for claiming charitable donations. It includes and calculates all itemized deductions you're eligible to claim so you can transfer the total to your tax return instead of the standard deduction. Other possible itemized deductions include things like medical and dental expenses you paid for yourself or your dependents over the course of the year, including insurance premiums, as well as other taxes you may have paid and home mortgage interest. You must actually donate cash or property. A pledge or promise to donate is not deductible until you actually pay. You must contribute to a qualified tax-exempt organization. Charities will let you know if they have 501(c)(3) tax-exempt status, but some organizations, including churches and other religious organizations, are not required to obtain 501(c)(3) status from the IRS. They count as qualified charities regardless, as do trusts and non-profit volunteer fire companies. You must meet several recordkeeping requirements. It includes saving canceled checks, acknowledgment letters from the charity, and appraisals determining the value of donated property. Your written records must indicate the name of the charitable organization, the date of your contribution, and the amount you gave. Canceled checks work well because the name of the charity, the date, and the amount of the gift all appear there. Bank statements are good, too, when they show a gift paid by debit card, and credit card statements work when they show this same information. Charitable organizations will often provide donors with written letters of acknowledgment or receipts. The IRS can disallow charitable donations of $250 or more if you don't have a written acknowledgment from the charity to document your gift. If you make more than one contribution over this amount, you'll need a separate acknowledgment for each one or the single acknowledgment must list each donation in detail with the date you made them. You have to be able to substantiate the fair market value of goods or property you donate, including vehicles, boats, or even planes, and you'll need a written acknowledgment from the charity for this type of gift as well. You must fill out Form 8283 and include this with your tax return if the property is worth more than $500. Make a list of the items you're giving away. You'll need these details for Form 8283. Note the condition of each item and arrive at a value. The IRS will allow a deduction for any item that's in good working condition or better. In other words, don't bother to claim a deduction for that old TV in your basement that hasn't worked in years, even if it just needs a single new part. At the very least, you must have it valued in its current condition without the new part. You can use valuation guidelines provided online by the Salvation Army or Goodwill for common items such as clothing, small appliances, and other household goods, Save the price tag and/or store receipt to prove the item's value if it's brand new. You can claim a deduction for food and groceries, too. You can deduct the cost if you donate groceries to a charity as well. Just be sure to get a written acknowledgment of your donation and keep your grocery store receipt to prove the prices of the items. Consider taking pictures of your donations. Having a picture handy of what you donated can be useful, especially if you're donating a lot of items. It isn't technically a requirement, but it can't hurt in the unlikely event that your return is audited. Just snap away on your phone, then send the pictures to your hard drive and save them. Prepare your own receipt to prove the donation. If you write it yourself ahead of time, you can simply have it signed when you drop off your items. This way you can rest assured that the receipt is correct and it includes all the information you need. Obtain a written appraisal if you're donating property worth more than $5,000. 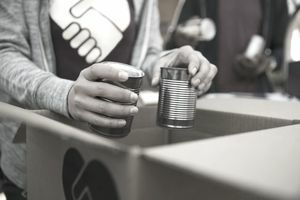 Generally, you can deduct contributions up to 30 or 50 percent of your adjusted gross income depending on the nature and tax-exempt status of the charity to which you're giving. You can deduct contributions of appreciated capital gains assets up to 20 percent of your AGI. Don't worry if your gifts exceed these thresholds. You can carry the excess over to subsequent tax years. Excess contributions can be carried over for a maximum of five years. However, your deduction may be affected if your AGI is too high. The AGI limits for 2017 were: $313,800 if you're married and filing jointly or are a qualifying widow(er), $287,650 if you're eligible to file as head of household, $261,500 if you're single, and $156,900 if you're married but elect to file a separate tax return. If you earn more than this, the total of your itemized deductions is limited to 80 percent of your AGI or three percent of the amount by which your income exceeds the limit, whichever is less. That still allows for a lot of charitable giving to whittle away at your tax liability if you want to itemize. Can You—And Should You—Claim a Deduction for Your Property Taxes? How Can You Claim a Sales Tax Deduction on Your Federal Taxes?